Qand Fishan Marriage/ Banquet Hall is most beautiful marriage hall of Gujrat. It is three halls Sohni Hall, Blue Lagoon and Darbar Hall; all are decorated and furnished differently according to the name of the hall. A spacious air conditioned play land (Ali Baba Joy Land) has been set up for children. Qand Fishan is also well known for its Delicious Sweets. It has also Pizza and Ice Creme Bar. 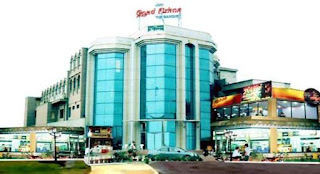 Qand Fishan Sweets have two branches; one is at Chowk Pakistan (Shishian Wala Darwaza) and other is at Ramtalai Chowk along with Qand Fishan Banquet Halls. Really Beautiful and great place. I also attend parties many time in this hotel. pla ap k rate kiya hain tin pack 2 kilo akiya rate he ?